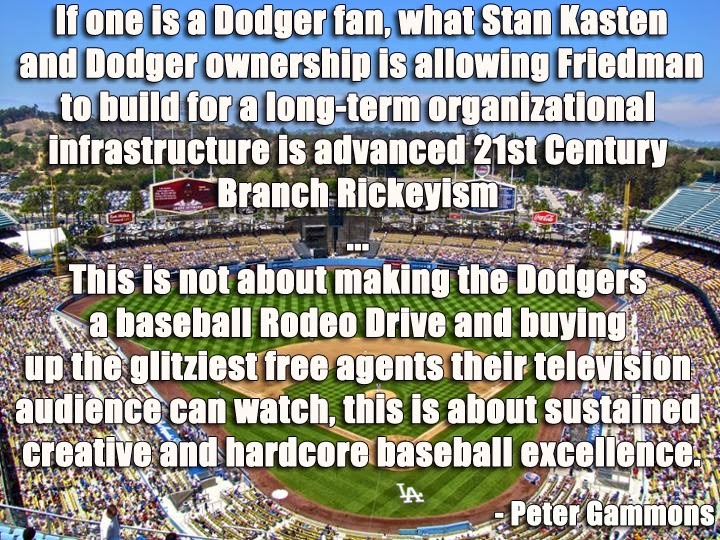 Dodgers Blue Heaven: UPDATED! 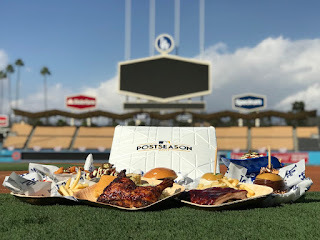 - World Series Series Starts on Tuesday - Food, Pregame Info and Other Stuff! 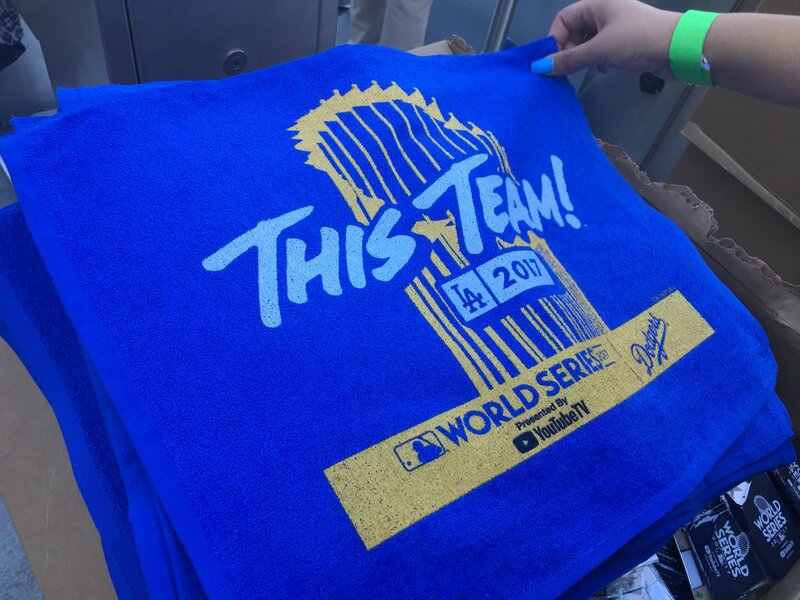 Here's a quick look at some of the key souvenirs you can find at the stadium. 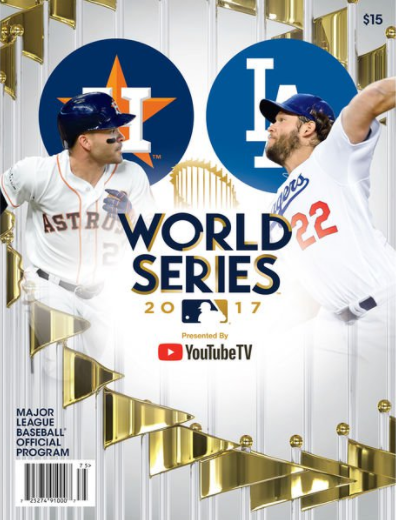 First off, here is what the 2017 World Series program looks like, and to its right is a peek at the official World Series Baseball. BTW, you can see the official World Series patch at the top-right. 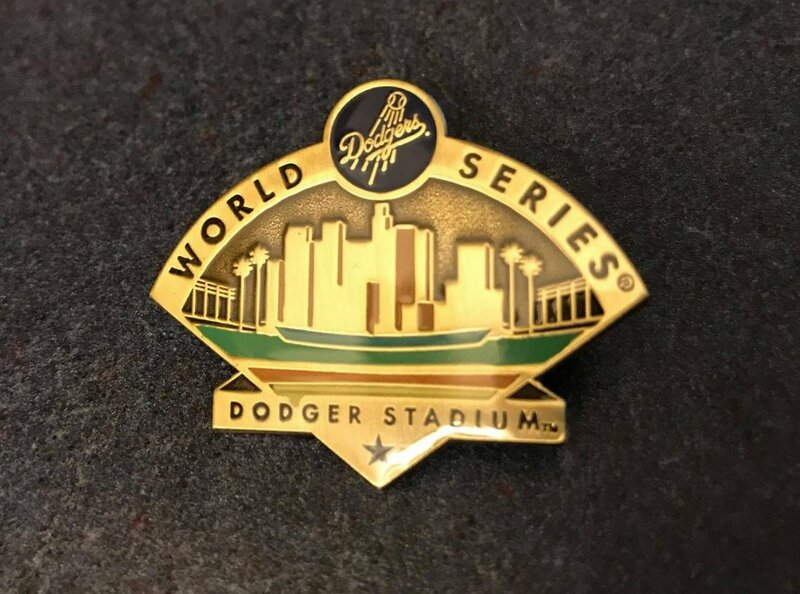 And here's the Dodger Stadium 2017 World Series pin, via Chris Creamer at sportslogos.net on twitter. 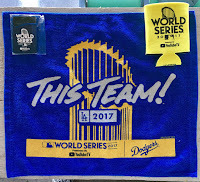 To its right is the Dodger Stadium Game 1 (likely for the entire series) rally towel being given out to all fans. 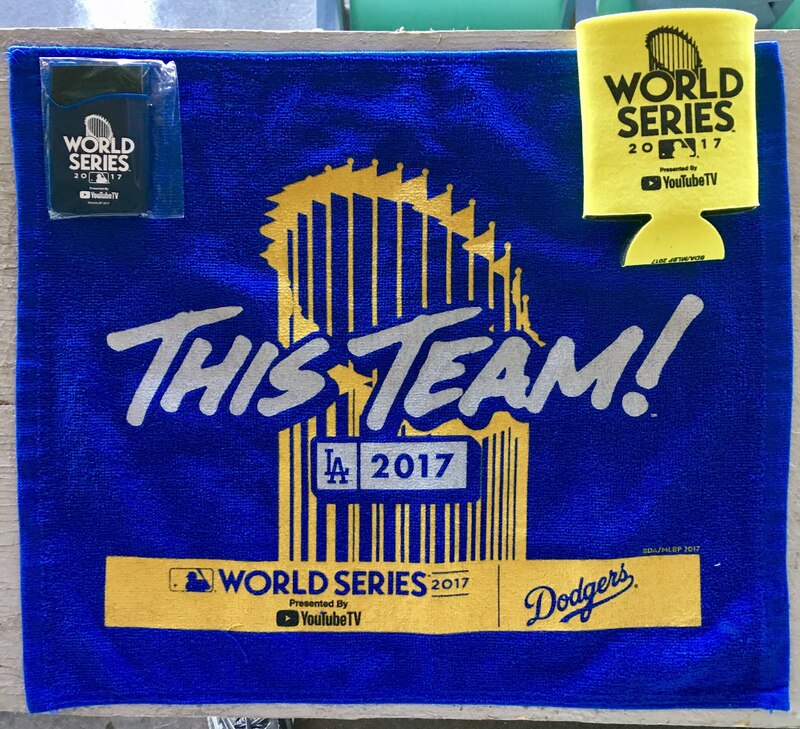 Also, you can find a 2017 World Series drink cozy (on the top-right in photo below) and a business card holder (on the top-left in the photo below) at the stadium. 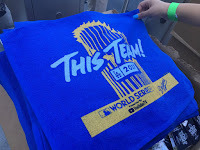 I'm unsure if this is given out at the gate or found elsewhere at one of those kiosk found throughout the stadium. Pic on the below right via David Young on Twitter. 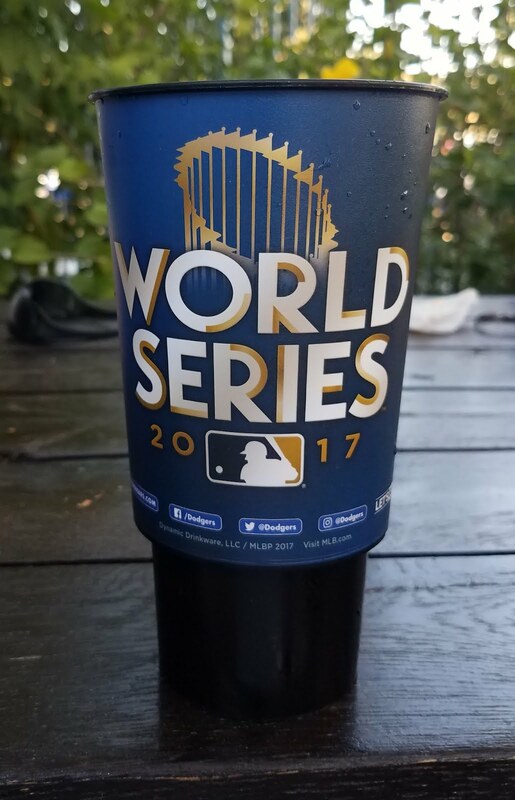 Also, here's a look at the Dodgers 2017 World Series souvenir cup, on the bottom right. This pic via Ron Cervenka on twitter. Like throughout the playoffs there will be a whole bunch of new and unique food options available for this World Series. 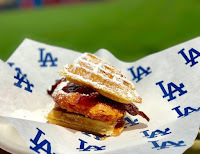 Furthermore, several items introduced during the Diamondbacks and Cubs series will also still be available -- Chicken Waffle Sammy (Belgian Waffle, spicy crispy chicken with candied smoked bacon, maple syrup) at Chick N’ Tots on Field level (section 8), Lots O’ Tots on Loge (section 136) & Tenders Etc. 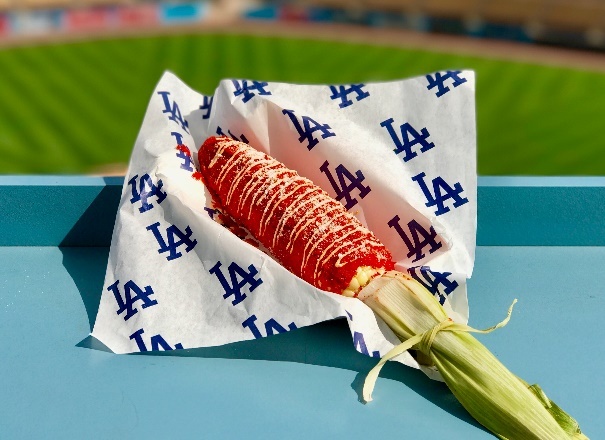 on Reserve level (section 14); and the Cheet-O-Lote (roasted sweet corn on the cob slathered in chipotle-lime mayo, dusted with Flamin’ Hot Cheetos, cotija cheese & tajin seasoning) at the King’s Hawaiian Grill on Left Field Plaza & LA Taqueria on Reserve levels (section 15). 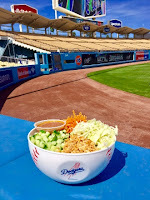 New to this series is the Vegan Noodle Bowl that will be available only at the Base Bowls on Field level (section 45). It features Vietnamese bean thread noodle, nappa cabbage, shredded carrots, diced cucumber, peanuts, diced jalapeño, peanut sauce. See it on the right. 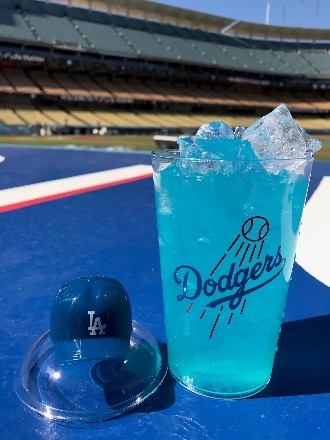 Also available is the Shrimp Shooter and it will be available only at the Blue Heaven on Earth Bar on Right Field Plaza & #ITFDB Bar on Left Field Plaza. It features grilled jumbo shrimp bathed in L.A’s michelada mix with a shot of Don Julio tequila. See it on the left. 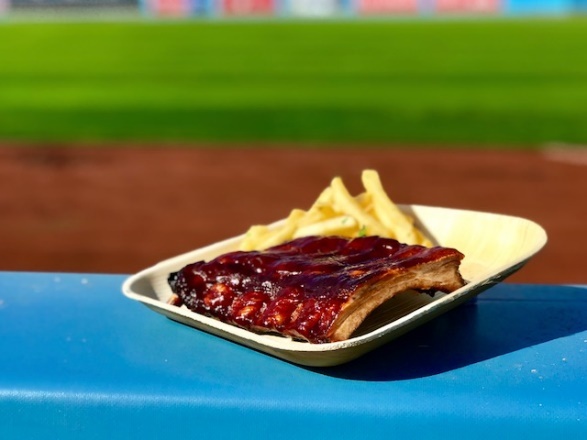 Char Siu Baby Back Ribs will be available at the Think Blue BBQ on Reserve level (section 30). It features smoked baby back ribs slathered in Char Siu style BBQ, served with garlic fries. 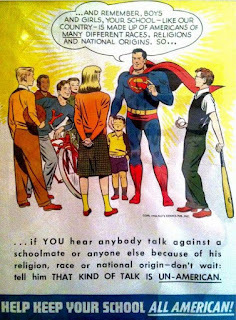 See it on the right. 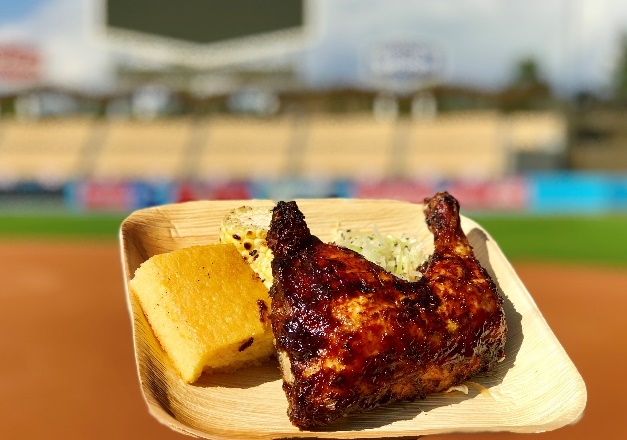 There will also be a Lobster Roll and Smoked Chicken Platter are available at the King’s Hawaiian Grill on Left Field Plaza. 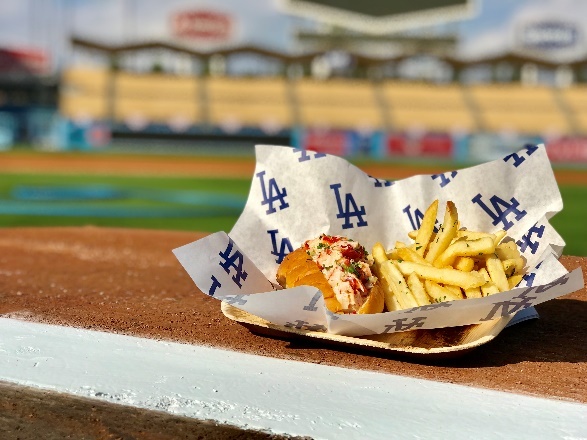 The Lobster Roll features New England style lobster mix on a King’s Hawaiian Sweet Roll, served with garlic fries. The Smoked Chicken Platter has smoked chicken leg & thigh with sweet smoky BBQ sauce, served with roasted corn, ramen slaw & corn bread. See them below. 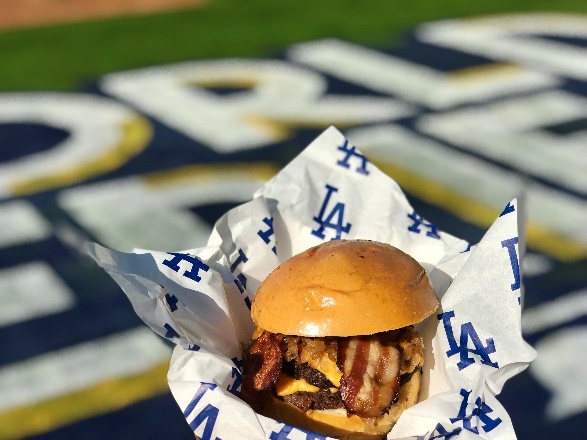 A Wagyu Beef Cheesburger can be found at the Elysian Park Grill on Field level (section 22 & 23) & Reserve level (section 31). It has a Kobe-style American beef ½ lb burger, creamy American cheese, crispy bacon, grilled onions, herbed mayo on a Brioche bun with kettle chips. See it on the right. 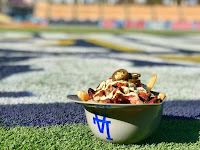 The "Al Pastor" Nachos and "Al Pastor" Fries can be found at the LA Taqueria on Field level (section 10) & Reserve level (section 15). 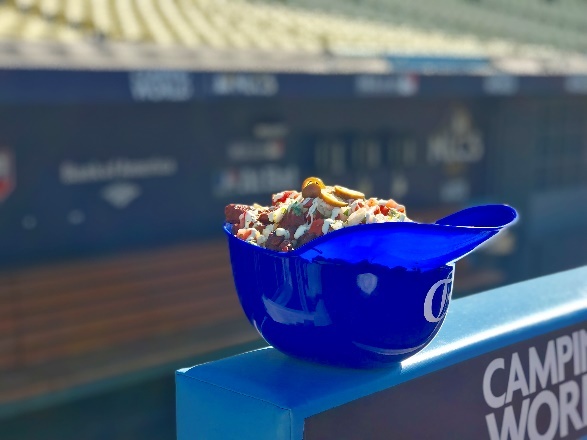 The nachos is served in a Major League Souvenir Helmet includes crispy tortilla chips topped with “Al Pastor” style pork, refried beans, nacho cheese sauce, pico de gallo & avocado crema. The fries also comes in a souvenir helmet includes crispy fries topped with topped with “Al Pastor” style pork, pico de gallo & avocado crema. 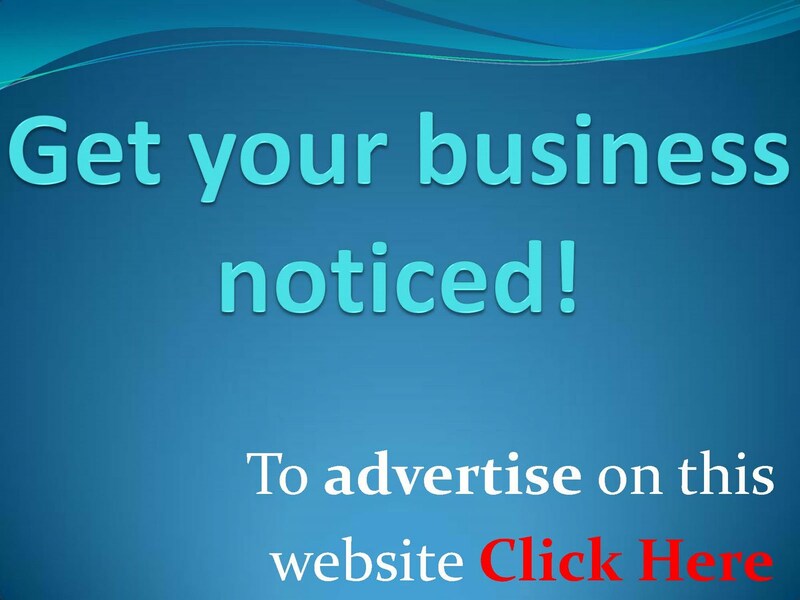 See them below. 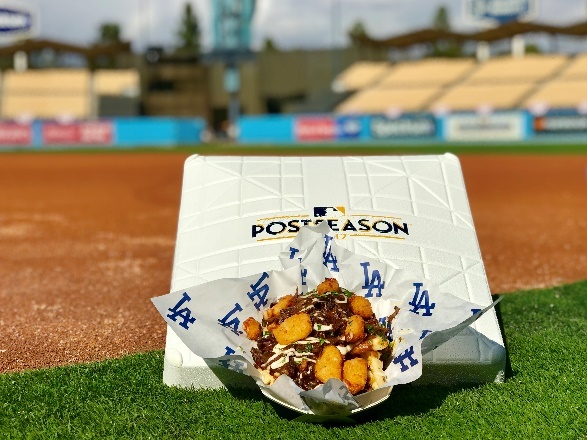 Short Rib Waffle Fries is available at the Bud & Burgers on Field level (section 47) & Top Deck Dogs Too on Top Deck (section 4). It has braised short ribs, red wine reduction sauce over waffle fries topped with crispy cheese curds. 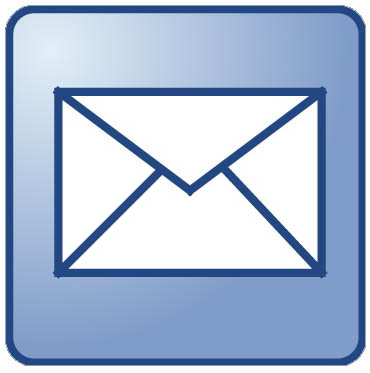 See it on the right. Vegan Nachos are at the LA Taqueria on Field level (section 10). 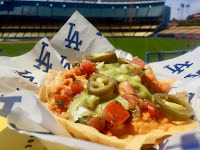 It has crispy tortilla chips topped with Vegan cheese, pico de gallo, jalapeños & salsa verde. See it on the left. 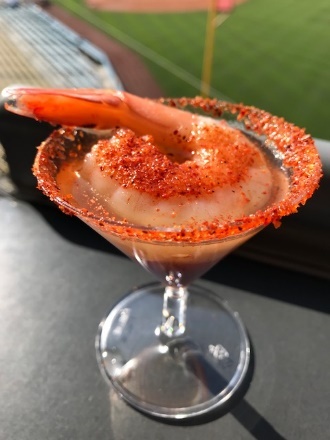 You can find Coctel De Camaron at the Marketplace on Field level (section 5), Loge level (section 137) & Reserve level (section 5). 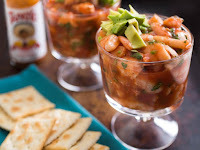 It is a Shrimp cocktail with tomato, cucumber, red onion, cilantro, avocado, jalapeño in shrimp broth & lime juice. See it on the right. 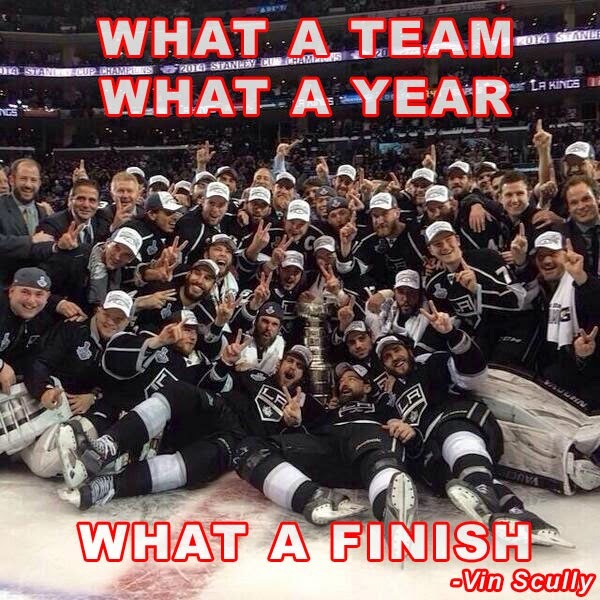 The This Team! Dog is at the Extreme Loaded Dog on Field level (section 48), Loge level (section 135) & Reserve level (section 2). It is an 1/3 lb. 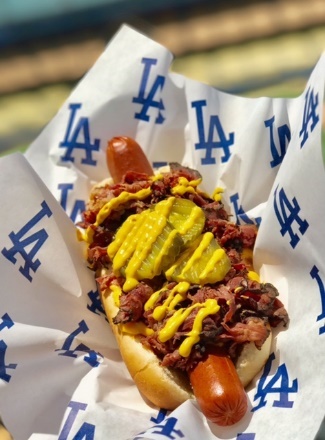 all-beef dog topped with chili, cheese sauce, pastrami, drizzled spicy mustard & pickles. See it on the left. The Blue Heaven Ice Cream Sandwich is at the Trolley Dodger Treats on Field level (section 46). 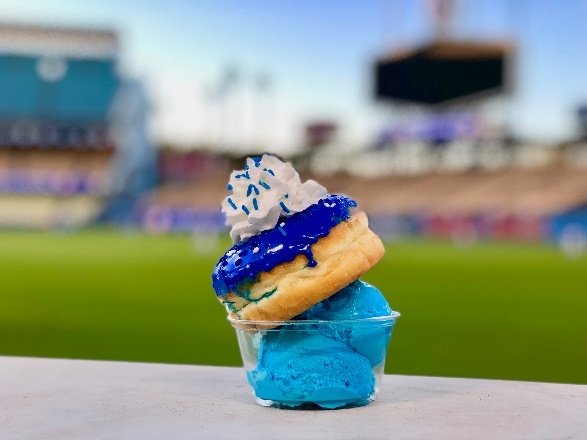 It has blue vanilla ice cream in a blue glazed donut with blue & white sprinkles. See it on the right. 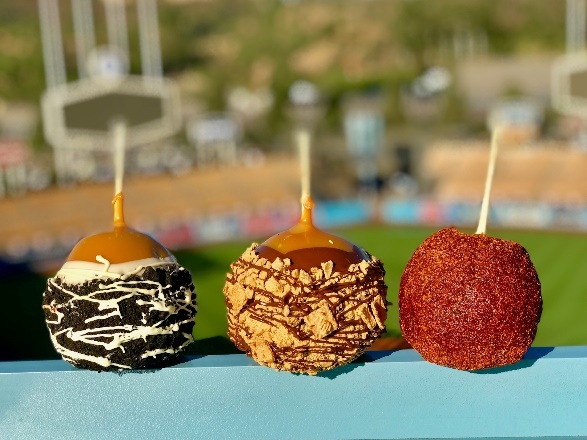 Specialty Apples will be at the Trolley Dodger Treats on Field level (section 46) & Marketplace on Loge level (section 137), Reserve level (section 5). There will be caramel apples with Crushed Oreos, S’mores or Chamoy. See it on the left. You can get a Churro Sundae at the Trolley Dodger Treats on Field level (section 46) & LA Taqueria on Reserve level (section 15). 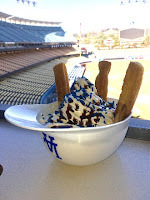 It features a cinnamon sugar churro compliments soft-serve ice cream topped with whipped cream, chocolate syrup & blue sprinkles in a helmet. See it on the right. 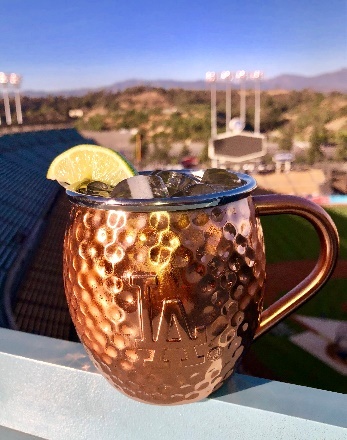 The Souviner Moscow Mule can be found at the Blue Heaven on Earth Bar on Right Field Plaza, #ITFDB Bar on Left Field Plaza. It is Ketel One Vodka, lime juice, ginger beer, lime wedge in a souvenir LA Ketel One mug. See it on the left. The Blue Slugger Cocktail is available at the Think Blue Bar on Field level (section 1) & Reserve level (section 13), Blue Heaven on Earth Bar on Right Field Plaza, #ITFDB Bar on Left Field Plaza, Hite Bar on Loge level (section 107), Rita Cabana Bar on Loge level (section 161) & Top Deck Buds on Top Deck (section 5). 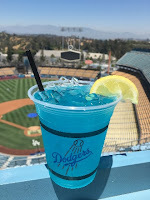 It has Vodka, Blue Caracao, Pineapple juice, fresh lemon sour mix with a splash of Sprite. See it on the right. The Blue Crush Cocktail is at Think Blue Bar on Field level (section 1) & Reserve level (section 13), Blue Heaven on Earth Bar on Right Field Plaza, #ITFDB Bar on Left Field Plaza, Hite Bar on Loge level (section 107), Rita Cabana Bar on Loge level (section 161) & Top Deck Buds on Top Deck (section 5). It has Ciroc Vodka, Blue Caracao, Sprite, Lemonade & sweet & sour. See it on the left. Tuesday's game starts at 5:09 PM. Auto gates open at 2:00 PM, and stadium gates open at 2:00 PM. Dodgers batting practice begins at 2:00 PM. Astros batting practice begins at 3:00 PM. The hosted in-stadium pregame entertainment begins at 4:00 PM. 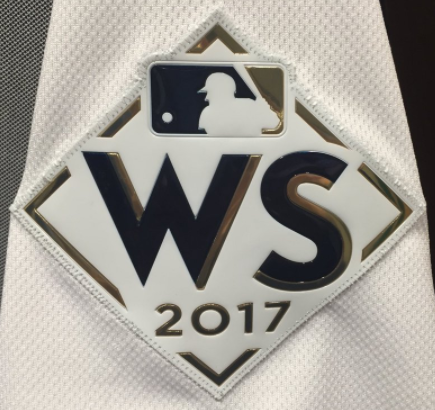 Pregame ceremonies begin at 4:30 PM. Player Announcements will begin at 4:45 PM. Gospel singer Keith Williams Jr. will return to sing the national anthem. As you'll remember, Keith came out to sing the anthem for Game 1 of the NLDS against the Cubs. 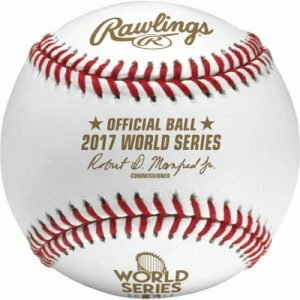 I suppose the team (or is this setup by MLB?) is hoping that he's a good luck charm. The Robinson family will throw out the ceremonial first pitch. 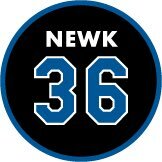 Wednesday's game starts at 5:09 PM. Auto gates open at 2:00 PM, and stadium gates open at 2:00 PM. 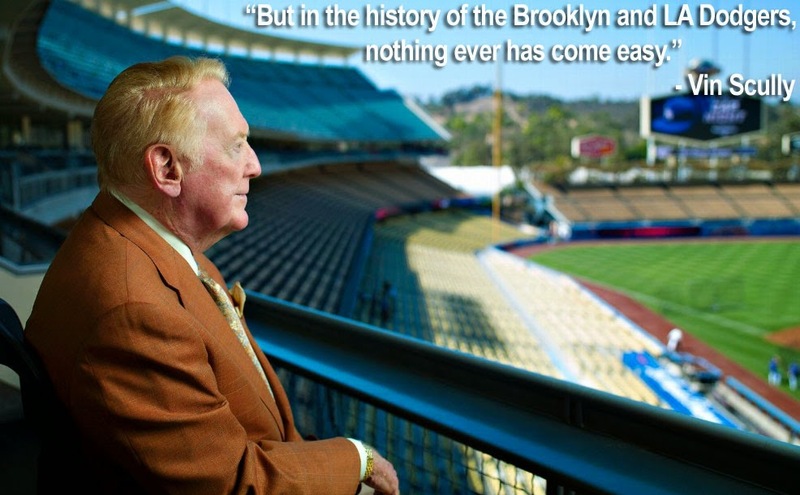 Dodgers batting practice begins at 2:00 PM. Astros batting practice begins at 3:00 PM. The hosted in-stadium pregame entertainment begins at 4:00 PM. Pregame ceremonies begin at 4:30 PM. 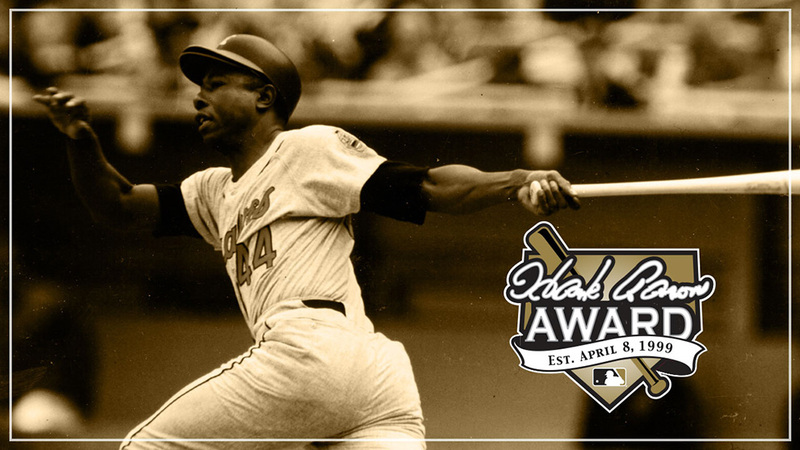 The Hank Aaron Award presentation will begin at 4:45 PM. 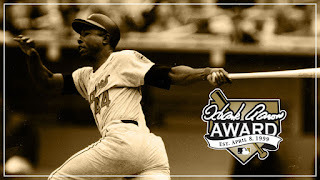 This award honors the most outstanding offensive performance in each league. 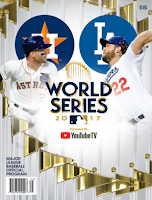 Rookie Cody Bellinger is Dodgers nominee for the award. Country singer Brad Paisley will sing the national anthem. Tuesday's game starts at 5:20 PM. Auto gates open at 2:00 PM, and stadium gates open at 2:00 PM. 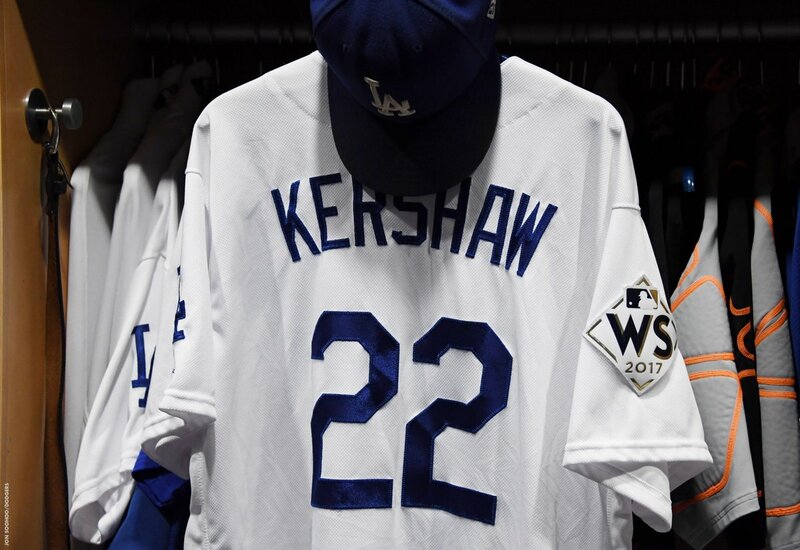 Dodgers batting practice begins at 2:00 PM. Astros batting practice begins at 3:00 PM. The hosted in-stadium pregame entertainment begins at 4:00 PM. Pregame ceremonies begin at 5:00 PM. Wednesday's game starts at 5:20 PM. Auto gates open at 2:00 PM, and stadium gates open at 2:00 PM. Dodgers batting practice begins at 2:00 PM. Astros batting practice begins at 3:00 PM. The hosted in-stadium pregame entertainment begins at 4:00 PM. Pregame ceremonies begin at 5:00 PM.